I am writing this blog from a small town north of the Arctic Circle, in Northern Norway. I’ve signed for Leknes FK. This is a new club and a new adventure for me, but its not unfamiliar territory. It’s been a couple of years since I last wrote a guest blog for Red Nation Online. This is my story of how I got here with some of the highlights so far. Let’s rewind a couple of years to 2012 and my last Red Nation blog. I had just finished playing my third season in Norway and had an exciting summer representing Canada in the CONCACAF Futsal Championships in Guatemala. I was looking for a new adventure and wanted to play closer to home after spending over the past four years abroad. I spent the 2013 and 2014 seasons in the USL PDL, on opposite sides of the continent. First with the Ocala Stampede in Florida, and then with Washington Crossfire near Seattle. During my time playing in the USL PDL, I began to crave playing in Europe again. I missed being in that environment and looked to find a way to get back. During the past two years, I have spent time on trial with clubs in Germany, Austria and Iceland. I’ve learned so much from each and every experience and consider myself very lucky to have had the chance to play football in so many different countries. While playing in North America, my life changed in an exciting way, as I met my new wife Laura, in our hometown of White Rock, BC. She deserves all the credit in the world for the support she has shown to me and my career, as she pushed me to go for my dreams and to be the best I can be. Following my latest trials in Iceland, I headed back home to Vancouver and turned my focus to preparing for our wedding this past summer. During this time, an opportunity came my way when I was contacted by the coaching staff of Leknes FK and informed of their interest to have me come over to play for them. Soon after they offered me a contract and we started to make plans to head to Norway following the wedding. Laura and I got married on July 18th, in our hometown. It was an incredible day with friends and family. I’ll never forget it. Two days later, we headed to Hawaii on our honeymoon. From there we headed for Norway, with a one-day stop at home in Vancouver. It was a whirlwind couple of weeks to say the least. We travelled halfway around the world within a couple of days. We had a short stop in one of my favorite cities, Oslo. It was my home a couple of summers ago when I last played in Norway. Following our short stay in the city, it was time for another travel day. We flew up North to Bodø, another city where I have played and once called home. From there, we got on a tiny plane and flew to our final destination, in the small-town of Leknes. 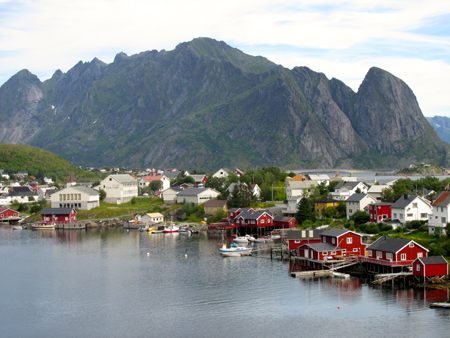 Leknes is located in the world-renowned Lofoten Islands in Northern Norway. It is a place I have always wanted to visit and I had never been here before; I was blown away with the scenery as soon as we arrived. 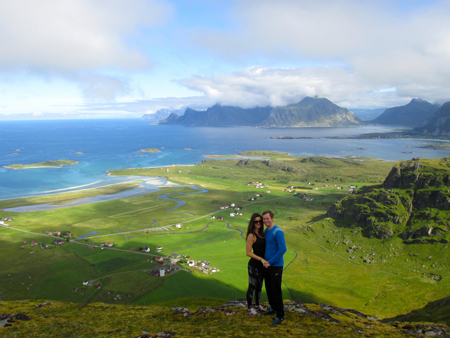 The tiny villages on the island are surrounded by the most incredible mountains and fjords. The water varies in color from emerald green to turquoise and some of the white sandy beaches are out of this world. Right away, I knew we were somewhere very special. I arrived on a Wednesday and basically had to go straight to training. It was exciting to meet my new teammates and see my new club for the first time. It was a bit of a unique situation for me with this club, as I had already signed before arriving. Typically I have been used to training with a club or being on trial for a period of time before signing for the team. To add to the situation, the club had their biggest game of the season on that Saturday against local rivals and the league’s first place team, FK Lofoten, who they hadn’t beaten in over five years. A win for Leknes would put them just 2 points behind FK Lofoten in the battle for first place, so there was quite a buzz around the club and around the town for the big game. I think it would be fair to say everyone was on edge and there was a huge amount of pressure on the team to win this game. The game was off to a good start when we took the lead, 1-0 about twenty minutes in. FK Lofoten had plenty of chances and started to control large parts of the game. Eventually they broke through to tie the game 1-1 just before halftime. In the second half, the coach turned to me and told me to get warmed up. I came on for my debut in the second half. In the 90th minute we played a free kick into the box and it was tapped in at the back post. 2-1! What a moment. The ref blew the final whistle and everyone was going crazy; you could tell how much it meant to the club to win this game. I was thrilled to have made my debut in such a big game. I was even happier and also relieved that we took the three points. Now that my first game was out of the way, it was time to start getting more used to my new surroundings. Everyone at the club was so welcoming. The coaching staff has been great to me and made me a part of the squad right away. Not only that, but they have made my wife Laura feel at home also. It has been a dream come true for the two of us to have the chance to live abroad together, while I am playing. It means so much to me to have this chance to see the world through football, with my wife. I had become very used to travelling alone and spending large chunks of time by myself when playing abroad. Now I have my best friend with me to explore and spend my downtime with. It’s such an incredible spot here in the Lofoten Islands and we have so much to see in a short amount of time. I signed a short-term contact with Leknes FK and we want to see as much as possible of this special place while we are here. The club has been so supportive in helping us settle in and it has been a fun experience living in a small place, away from large cities. Leknes has a population of just over 3000 people. To put that into perspective, I think that my high school had a similar amount of students enrolled. It is a quiet way of life here and people here spend much more time outdoors than what we are used to back home. I enjoy the lifestyle, it’s a refreshing change. The hikes in the surrounding mountains are unlike anything I’ve seen before. We are North of the Arctic Circle and experience the midnight sun here through the summer months. 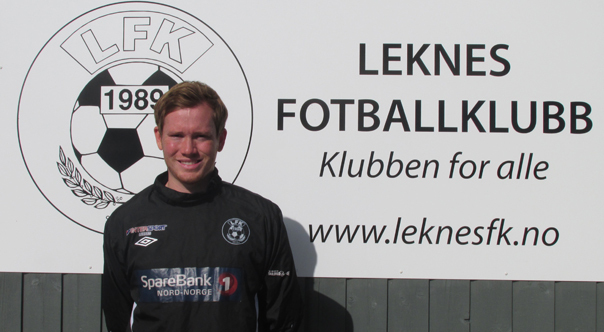 I played my second game for Leknes FK this past weekend. It was my first start and we won the game 4-0. A great result for an away game. I am getting more used to my new teammates and surroundings. I had missed playing in Europe so much. It means the world to me, to be back here and have this opportunity. I am excited everyday to get up and go to training. In the past couple of years I have grown as a player and a person. I’ve had so many special opportunities to travel the world through my football. I would definitely say gaining maturity has changed the way I approach this opportunity. I’ve come to learn that these opportunities are tough to come by and that you have to soak it all in. I’ve always had the self-belief that I would get back here. I’m just trying to enjoy every single day and enjoy this experience to the fullest. Now I’m no longer the youngest guy on the team trying to break in. I’m one of the older and more experienced guys at 25 years old. Now that I have my wife with me, I have to look after her as well as myself. Luckily for me, she looks after me as much as I do her and has been such a wonderful support through this whole journey. I am excited to see where things go from here and what the rest of this trip brings us. Most of all, I want to give my best every single day and continue to make memories that will last a lifetime. Robbie Tice can be found writing about his career, life home and abroad at Robbie Tice - Canadian Footballer, and can be followed on Twitter at @robbietice90.